MiG-21 was built in more than 11.000 examples so it is no wonder, many of them were used in experimental roles. 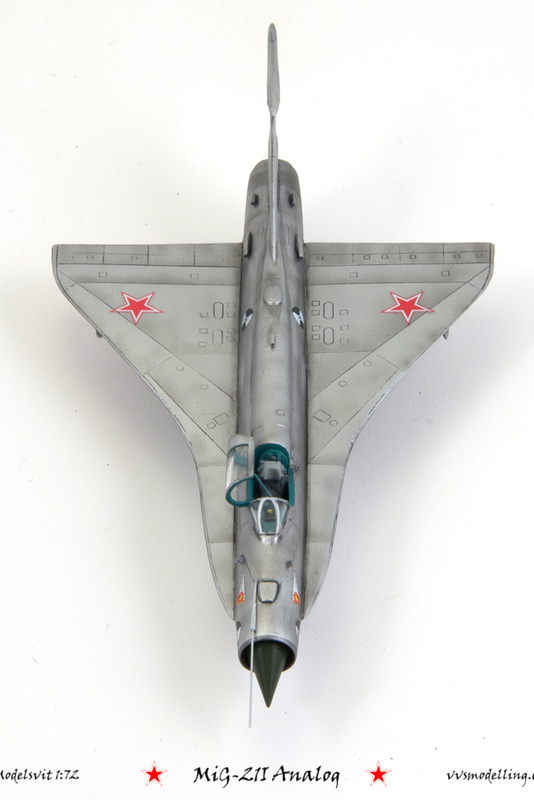 MiG-21I’s main task was to test different wing shape profiles for the upcoming supersonic airliner Tu-144. Two prototypes were built, based on the MiG-21S airframe. Second prototype was tested at Gromov Flight Research Institute at Zhukovsky. Many cameras were added to the hump and top of the tail and the center-of-gravity was regulated by weights added to the nose and tail of the aircraft. MiG-21I first flight happened on 18th April 1968 and both aircraft made more than 140 flights – first prototype crashed during aerobatic routine, killing test pilot V. Konstantinov while the second prototype was transferred to the Monino Air Force Museum near Moscow, where it stands besides the Tu-144 until this day. Always a pleasure to read articles from you. Nice epilogue.The finished model looks great! What is the yellow piping ?